To me, part of achieving good health is having good health insurance that allows me to become healthy and stay healthy. It’s not something that I use all that often since I’m still young and don’t need much besides an annual physical and checkup. But I still get worked up thinking about what if I get into a bad car accident and have no health insurance to cover my costs. I’ve long determined that I should always have health insurance coverage for those emergency moments, and so that I can sleep easy at night. Since graduating college and no longer being covered under my mom’s health insurance, I have struggled a lot with finding good health insurance. The plans are complex and confusing, and even after days of intense research, I can’t tell if one plan is better than another. All I can remark upon is that I am a college graduate, and I feel completely helpless in even comprehending what the different health insurance plans are trying to offer me. I am neither uneducated nor unhealthy, yet finding the right health insurance is very difficult for me on my own. I can only imagine what the process is like for someone with less education than me, or even worse, in need of better insurance to cover their ailing health. I’ve always chosen what seemed to be the better plan, try it out for some time, and then determine the plan sucked really bad and repeated the whole research process. For someone as young and healthy as me, it’s odd how much I’ve already had to deal with in regards to health insurance. An emergency would pop up or some blood tests were done for a routine physical, and then the huge bills would come in. The insurance would never cover as much as I thought they said they would in the first place. It was quite ridiculous how much I had to pay for a routine blood test or for an ER doctor to sew up a small cut on my hand. With health insurance, I expected to pay a lot less. So my search for better insurance would restart again and again. This went on for more years than I would have liked. I once cut my pointer finger knuckle wide open when I was washing a glass cup and it broke on my hand. Talk about a dangerous chore! I had to get 5 stitches in the ER, and I also had to pay an arm and a leg for it! 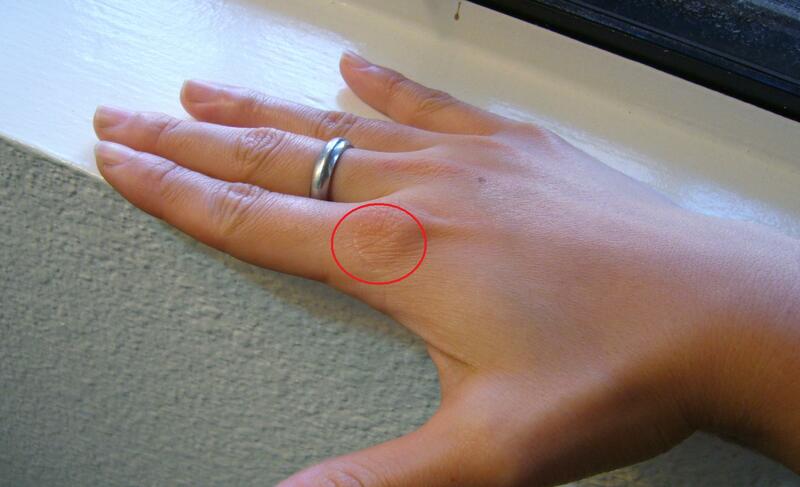 It’s been a few years since this happened, but I’ll always have this little scar to remind me of the days when I had unnecessarily expensive health insurance. Luckily, one of my buddies from high school, Melissa, is now an insurance broker. She and her husband often made mentions on Facebook about health insurance and how they helped their clients get great coverage. When I found this out, Rene and I were ready to invite some professional help into our search for better health coverage. And even better if we hired a friend to do this for us! When Rene and I met up with Melissa and her husband, Steven, to talk about health insurance, it was pure awesomeness. Not only did we find two extremely knowledgeable people who knew exactly what kinds of insurance we were looking for, but they also were young and hip and a happy working couple, just like us! Rene and I had a lot of questions, all of which were answered promptly by Melissa and Steven. Melissa and Steven own Griswold & Griswold Insurance Agency, Inc. With their help, I’ve never been happier with my health insurance coverage! We learned that to hire them as our insurance brokers doesn’t even cost us anything more than having health insurance. Insurance brokers make commissions off of the health insurance their clients buy. And whether you have an insurance broker or not, you’re still paying that fee in your premiums. It doesn’t make sense for people to not have insurance brokers, since they have to pay for that fee no matter which insurance they buy. It also makes sense to use an independent broker since they will not be biased like those insurance brokers working for a specific health insurance company. I wish I had known this earlier, it would have saved me so much time and effort! We also learned a lot about Health Savings Accounts and how much you can really save with getting a health insurance plan that supports an HSA. So many things can be tax deductible with an HSA, even things like my office visits, pharmacy drugs, glasses, contacts and contacts solution. And here I was paying for all those before without getting any tax benefit! These plans are so awesome, Rene and I signed up for one pronto. Now, Rene and I are enjoying some awesome health insurance, which allows us to freely visit the holistic doctors we choose, save money on our premiums, and hopefully save quite a lot come tax season. And whenever we need a question answered or some help dealing with our insurance companies, we now have the best people to turn to. Rene and I are looking forward to getting some insurance for our home and our business, too, and I know just the people who will get us some superb coverage! I’m really happy having Melissa and Steven and their office working for me, and I highly recommend their services to anyone who wants better insurance coverage. Go check out their site: Griswold & Griswold Insurance Agency, Inc. You’ve got nothing to lose since they just want to better inform you of your choices and won’t ever push you to buy anything. Plus they have superb customer service and are quite timely in their responses. By the way, I’m not being paid to write this, I just love the service I got from Griswold & Griswold so much that it would simply be wrong of me not to share. Does anyone else have trouble finding good health insurance, or was it just me? Is there a reason why health insurance is so difficult to navigate? I’m glad that there are awesome insurance brokers out there to help us out, but why is it so confusing to begin with? Tell me what you think!